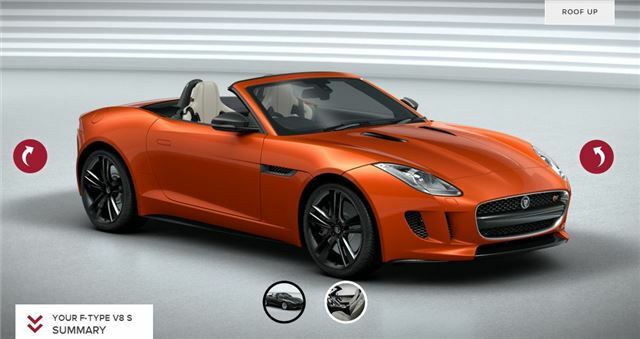 Jaguar has launched the configurator for its latest sports car, the F-Type. For anyone who fancies a Friday of procrastination and dreaming ‘what if’ it’s the perfect distraction, but it also reveals some of the interesting customisation options Jaguar will be offering to F-Type customers. There are four roof colours – black, red, beige and grey, as well as 13 different exterior paint finishes, including, of course, British Racing Green. There are also numerous different seat options, from more simple, entry level sports seats to performance seats for enthusiastic drivers. All are trimmed in leather. Buyers can trim the cabin in all manner of different materials and finishes, and the options even extend as far as letting you choose the colour of the seat belt. There are also three grades of audio equipment, and buyers can choose an active exhaust or a switchable sports exhaust, which is ideal for people who like to make a bit of noise! For more information on the Jaguar F-Type, click here. If you want to configure one yourself, click here. Why not share your dream F-Type with us on Twitter?